Not a month after Hurricane Sandy there’s a rough consensus about how to respond. 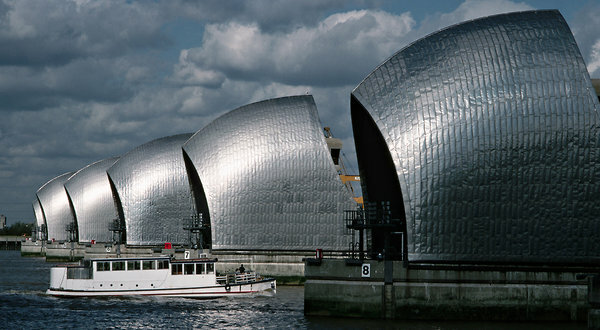 America is already looking to places like London, Rotterdam, Hamburg and Tokyo, where sea walls, levees and wetlands, flood plains and floating city blocks have been conceived. 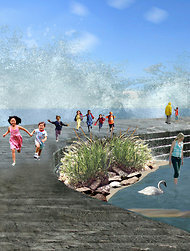 A rendering of a proposed 40-acre park for Governors Island, with a shoreline promenade. 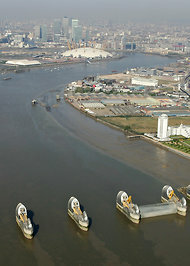 An aerial view of the Thames flood barrier in London. Robert Moses, about 1938. He accumulated unbridled authority to build major projects. New York clearly ought to have taken certain steps a while back, no-brainers after the fact. The Metropolitan Transportation Authority ought to have installed floodgates and louvers at vulnerable subway entrances and vents. Consolidated Edison should have gotten its transformers, and Verizon its switching stations, out of harm’s way, and Congress should have ordered the Army Corps of Engineers to study the impact of giant barriers to block parts of the city from the sea. Scientists, architects, planners and others have, of course, been mulling over these issues for years. They’ve pressed for more parkland and bike lanes, green roofs and energy-efficient buildings, and warned about the need for backup generators, wetland edges along Lower Manhattan and barrier islands for the harbor to cushion the blow of rushing tides. Hurricane Sandy was a toll paid for procrastination. The good news? We don’t need to send a bunch of Nobel laureates into the desert now, hoping they come up with some new gizmo to save the planet. Solutions are at hand. Money shouldn’t be a problem either, considering the hundreds of billions of dollars, and more lives, another Sandy or two will cost. So the problem is not technological or, from a long-term cost-benefit perspective, financial. Rather it is the existential challenge to the messy democracy we’ve devised. The hardest part of what lies ahead won’t be deciding whether to construct Eiffel Tower-size sea walls across the Verrazano Narrows and Hell Gate, or overhauling the city’s sewage and storm water system, which spews toxic waste into rivers whenever a couple of inches of rain fall because the sea levels have already risen so much. These are monumental tasks. But more difficult still will be staring down the pain, dislocation and inequity that promise to upend lives, undo communities and shake assumptions about city life and society. More than requiring the untangling of colossal red tape, saving New York and the whole region for the centuries ahead will become a test of civic unity. In New York last week to tour the damage, President Obama named Shaun Donovan, his secretary of Housing and Urban Development, a New Yorker and former housing official in the city, to spearhead federal recovery efforts. Mr. Donovan is an obvious choice. But then the president reflexively pledged (and the vice president followed up with the same promise on Sunday) to restore ravaged neighborhoods and homes in Queens and on Staten Island to the way they were before Hurricane Sandy. That was business as usual, and the last thing the region or the country needs. At this point there’s no logic, politics and sentiment aside, to FEMA simply rebuilding single-family homes on barrier islands like the Rockaways, where they shouldn’t have been built in the first place, and like bowling pins will tumble again after the next hurricane strikes. “Retreat is a dirty word,” as Robert S. Young, a North Carolina geologist, has described American sentiment, but better finally to face reality and make plans for smarter construction, compensation and even, where necessary, relocation. Elected officials and utility companies shouldn’t just turn on the lights and heat and restore crippled elevators in forgotten public housing projects that were inadequately designed in the first place. Common sense dictates upgrading many of these projects to withstand floods but also devising new homes elsewhere for some residents. Cost-benefit analyses, long overdue, should answer tough questions like whether it’s actually worth saving some neighborhoods in flood zones. Communities like Breezy Point should be given knowledge, power and choice about their options, then the responsibility to live by that choice. This means embracing a policy of compassion and honest talk. It’s no good merely to try to go back to the way things were, because they are not. This sort of conversation is a third rail of American politics, so it’s no wonder all presidents promise to rebuild and stick taxpayers with the tab. That billions of dollars may end up being spent to protect businesses in Lower Manhattan while old, working-class communities on the waterfronts of Queens, Brooklyn and Staten Island most likely won’t get the same protection flies in the face of ideas about social justice, and about New York City, with its open-armed self-image as a capital of diversity. But the decisions ahead come down to nature and numbers, to density, economics and geology. Our relationship to the water can’t stay the same, and at the same time the city is not worth saving if it sacrifices its principles and humanity. So the real test post-Sandy will be negotiating between the two. Faced with cholera and calamitous urban living conditions in the early 1800s, city planners ran roughshod over property rights to install the street grid. Outrage gradually yielded to rising real estate values, Central Park and the modern metropolis. 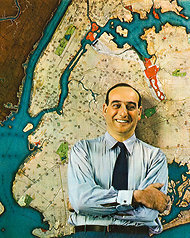 During the last century Robert Moses, accumulating unbridled authority to get what he wanted done, bulldozed into existence parks and beaches, highways and housing projects by recklessly destroying old neighborhoods, starving mass transit, crushing opposition and “hounding the people out like cattle,” as Stanley Isaacs, the former Manhattan borough president, said of the hundreds of thousands of mostly poor New Yorkers that Moses displaced. The defeat of Westway, a Moses-scale proposal during the 1980s to bury the West Side Highway and cover it with parkland and new development, in a sense became the public’s epitaph for Moses. Whether that defeat was bad for the city is a question for another time. But New York became more attuned to community-based initiatives, to preservation, environmentalism and circumspection, all good things in ordinary circumstances. At the same time it lost something of its nerve. I walked around Brooklyn Bridge Park last week with the landscape architects Matthew Urbanski and Michael Van Valkenburgh, who designed it. We stood by the salt marsh they installed where an old pier had once been. An acre of formerly obscured shorefront opened to the sky. The park survived Hurricane Sandy with hardly a scratch, proving the virtue of soft edges. In the design process Mr. Van Valkenburgh had asked the state Environmental Conservation Department, which polices the coastline, for permission to float a north-south footbridge, just 12 feet wide, between the embankment where the old pier ended and the next pier over, where the architects are installing sports fields. The idea: People wouldn’t have to walk all the way around the shore to get from one pier to the other. The department said no. 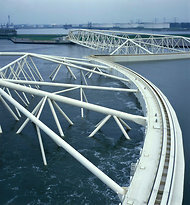 The narrow bridge’s shadow might disturb the habitats of fish. It was the argument that torpedoed Westway. Now the task is to create a whole new ecological infrastructure for the region. The hurdles go beyond just a single state authority fearful to concede even a footbridge. They include an alphabet soup of agencies and public officials: Congress and the governors of New York, New Jersey and Connecticut; the Corps of Engineers; FEMA; the Homeland Security Department; the New York State Public Service Commission (which in principle has the leverage to compel companies like Con Ed and Verizon to safeguard its equipment); Amtrak; the Metropolitan Transportation Authority; the city’s planning, transportation, parks and environmental protection departments; and the Port Authority, devised as the organization in charge of such epic undertakings, today a shadow of its former self. The Australians have a mantra for battling climate change: Protect, Redesign, Rebuild, Elevate, Relocate and Retreat. Guy Nordenson, a New York engineer who has spent years researching the subject, talks about controlling floods and controlled flooding, accepting that the water will ultimately get in. This means thinking like the Australians, long term about evolving nature. Our election cycle tends to thwart infrastructural improvements that can take decades and don’t provide short-term ribbon-cutting payoffs for politicians, which is why it’s a wry commonplace among engineers and architects that autocratic regimes make the most aggressive builders of massive projects. For New York sea gates alone won’t fix the city’s problems any more than will porous streets with catchment basins and waterproof vaults under sidewalks to secure electrical systems. At the same time this is a golden opportunity for the United States to leapfrog countries that have pioneered innovative architecture like garages doubling as floodwater containers and superdikes serving as parks and high-density housing complexes — a chance for designers, planners and engineers finally to get back, after so many decades, to the decision-making table. The question is: Can we accomplish this in time and fairly? A version of this article appeared in print on November 20, 2012, on page C1 of the New York edition with the headline: Vetoing Business as Usual After the Storm.